On the island of Sa Dragonera you will encounter thousands of small, long-bodied reptiles that impress with their long tail, four legs, movable eyelids, and a rough, scaly, or spiny skin. The lizard is the Podarcis lilfordi giglioli, a subspecies of the Lilford’s Wall Lizard. Since 1995, the island has been protected as a Parque Natural (Nature Reserve). The photo was taken near Sant Elm, Mallorca, Baleares, Spain. The date: April 30th, 2014. Back in 1971-72 (before my stint on a duck farm), I crewed on a French yacht out of Puerto Andratx for several weeks. One day we sailed to Sa Dragonera. We anchored off the south shore and I and the owners sons scrambled up the rocks to the monastic ruins at the top of the cliffs. While exploring in the lower levels of the ruins, we came across a baby lamb. It was quite recently dead, with no sign of injury or decay. It looked very much like it was just sleeping. It was lying in a shaft of sunlight from a window cut into the rock of the cliff, at the bottom of a flight of stone steps. After descending to the boat, we sailed to the northern part of the island, anchored, & went ashore near the lighthouse. The keeper came out & we chatted for a bit. In the course of chatting about the island, I asked if he was missing one of his lambs. He assured me that, not only did he have no lambs, there were no sheep on the island! I told him about our discovery…. he told me I must be mistaken, but we all assured him that we had seen it. He looked a little puzzled, but had no explanation, just repeating that he was sure there were no sheep on the island. It’s puzzled me for 40+ years now, how a newly dead lamb came to be resting in the basement of such an obscure & difficult to reach location. 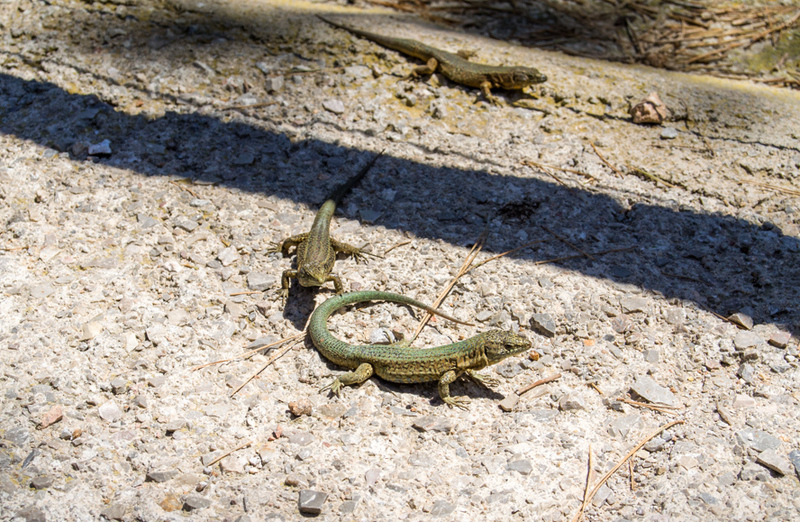 Needless to say, your note on the lizards of Sa Dragonera brought it all back… Thank you for sparking my memory! thanks for telling us about your mysterious encounter. During my 27 years of living in Mallorca I have encountered numerous such inexplicable events but have found eventually that there always is an explanation to the riddles. In the case of your encounter in Sa Dragonera, perhaps a bird of prey had brought the lamb from the shores of Mallorca to the spot where you found it, only to be disturbed by something or someone (perhaps you?). After your departure, the raptor might have returned to devour his prey in peace and quiet. We’ll never know. Now that’s the first plausible explanation I have ever heard! We found the lamb in the dark foundations beneath the ruins. It was a long gallery cut into the actual rock of the mountain, & the only light came from a series of large “windows” cut into the cliff face on the north side. We actually descended into the basement under the ruins because it was cool, after our long, hot climb. From the point of view of an eagle, those windows would have looked like perfect roosts, cut into the cliff. The lamb probably weighed 2-3 kilos…does Mallorca have raptors able to take prey of that size? Here in southern New England we have both eagles & ospreys which could do that, but Im not sure what big birds of prey inhabit Mallorca. I suppose the bigger mystery is how & why people built such imposing buildings in such a difficult & inaccessible spot. I cannot imagine what labor it must have taken to chisel into the mountain top of Dragonera & build such big impressive buildings up there. It would be very hard to do today with modern tools & machinery. In those days, with only hand tools & human (or animal) labor…it boggles the mind.